This theater, designed by W. Scott Dunne, was built in 1938. The theater’s Streamline Moderne design consisted of a white stucco exterior. A large sign resting on top of the building spelled out “Delman” in bright neon letters. The building included the Delman Shop. The theater’s Streamline interior included a curved metal railing and stepped banister which led up to a large balcony. Its interior walls also consisted of white stucco. And to think a cookie-cutter Walgreen’s has taken its place … boo, hiss. Rotary Club and Tulsa Public Library present an online exhibit of Beryl Ford Photograph Collection which traces Tulsa from its humble beginning as a shabby western town to todays sophisticated city. A 1987 photo of the Delman Theater in Tulsa. It must have been a grand theater at one time. Why does it keep getting repeated that the Delman Theatre had the largest seating capacity in Tulsa? I think this rumor started with Tulsa Historical Society. At 1186 seats it obviously wasn’t a large theatre at all, much less Tulsa’s largest. “The Old Lady on Brady” has the largest seating capacity. Next was the Ritz Theatre with just under 2000 seats. 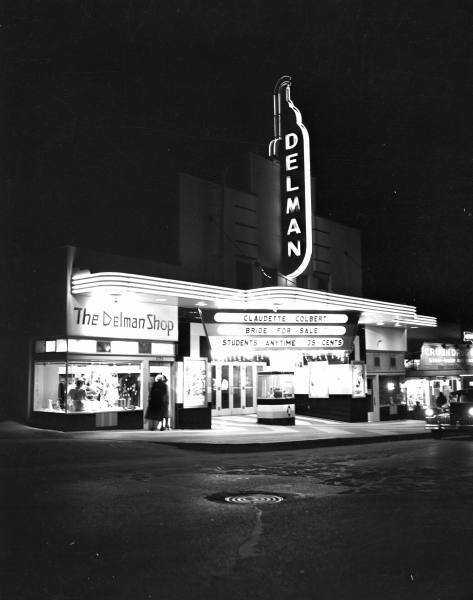 The Tulsa Delman was one of a series of Delman theaters built by Isadore Adelman. The others were in Houston, Dallas & Fort Worth. The Delman and the Brook were leased by Loews for a couple of decades.